Honest! But so far, I have not received any credit for beginning something that is now a BIG tradition at Carolina Hurricanes games, something which is now starting to become commonplace at other NHL venues. I will go down in history right beside that guy who walked into Brian Epstein's NEMS music store in Liverpool in 1961 and asked for the Beatles record. But I really did do it. So please don't compare me to Al Gore and the internet. Hockey tailgating was born of my generally being too broke to afford beer and food inside of the hockey arena. We'd just purchased a new home and after buying a ticket, had no extra money to spare. It was early 1998, the latter part of the Carolina Hurricanes' first season in North Carolina. The former Hartford Whalers had moved and renamed the franchise, but had to play their first two years at the Greensboro Coliseum while the new arena was being built in Raleigh. Back then, I would leave work in RTP around 3:30 and drive to Greensboro. Upon arriving I'd stop at a small convenience store near the arena where—between the bongs, crack pipes, ephedrine tablets, switchblades and other things they sold—one could find Foster's Lager Oil Cans. I'd buy two, drive to the parking lot, drink them, then go in. After a while, especially after I started bringing the then-3-year-old B-Man to the games with me, this "morphed" into taking a few snacks along, too. 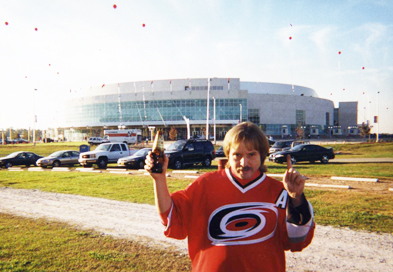 So when the Carolina Hurricanes played their very first game in the new Raleigh Entertainment & Sports Arena on Friday, 10/29/99 against the New Jersey Devils, I pretty much knew I was going to continue the tradition. Only this time, since I'd be parking near N.C. State's Carter Finley Stadium I figured I could just take the grill and some hot dogs along like people did for the football games. The friend who accompanied me, Mike McCarty, agreed. So around 4:00 PM we headed to the new arena and parked by the "A. E. Finley Fieldhouse" end of the stadium, set up the grill, started cooking hot dogs and drinking Michelob beers. NOBODY else in the entire lot, as far as we could tell, was doing likewise. Everyone walking past us looked at us as if we'd completely lost our minds. The above photo was taken that day. Note the big "grand opening" balloons in the background. Also, NO sign of any of the cars tailgating. This tradition continued at subsequent hockey games, in spite of the Hurricanes front office who—at the time—issued a "No Tailgating" proclamation. Apparently, they thought that this would cut into the profits that they intended to make selling food and drinks inside of the building. About this time, we learned that it was permissible to park across Trinity Road at the N.C. State Fairgrounds parking lot FOR FREE. Because we wanted no trouble over the tailgating, also to save the parking fee and get some exercise from the extra walking, we started doing this. But the tailgating went on! And over time, we started seeing others do the same. Tailgating grew in popularity and was eventually recognized by the Hurricanes' front office. In 2000, then-manager Jim Cain and the rest of the team's front office issued the "Contract With The Fans" which sought to address many of the issues regarding the team's handling of the fans—issues which caused people to not want to attend the games. One of these issues was the tailgating ban. Mr. Cain reversed the prior tailgating policy and said "not only is it welcome, we encourage it" so those of us who had been doing it all along continued, and even more people joined the party. Hockey tailgating received international press coverage during the Hurricanes' remarkable run to the Stanley Cup Finals in the spring of 2002. The visiting press corps of the four northern teams we played—the New Jersey Devils, Montreal Canadiens, Toronto Maple Leafs, and Detroit Red Wings—had apparently never seen such a thing and covered the phenomenon intensley as part of the "human interest" aspect of the playoffs. 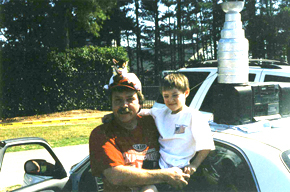 This was the year that The B-Man and I made our original "from scratch" replica of The Stanley Cup. During the 2002 Toronto series, my wife and daughter headed off on a Girl Scouts trip. The B-Man and I had a Saturday night game coming up and that morning we decided that we needed a Cup. So we headed off to the nearest craft supplies place; came home with about $60 worth of styrofoam, foil, wooden dowels and a salad bowl; and in four hours we had a Stanley Cup. Well, if you're a member of a Toronto TV crew roaming the parking lot at the visiting team's building looking for human interest stories, you strike gold when you walk around the corner and see two guys in hockey garb, beer, a hot-dog-covered grill, a cute kid and a Stanley Cup. We were taped and interviewed on several occasions. I recall being in front of the camera—full of beer—telling all the people in Toronto "Thank you for brewing all the Foster's at Carlson United Breweries in Toronto!!! Welcome to North Carolina!! WE HATE MONTREAL!!!" "The pinnacle of the tailgating for me was before one of the playoff games, I just happened to be sitting in the locker room lounge and turned on the TV and they were showing a landscaper who came to the parking lot. He pulled a pool out of his truck, filled up the pool with air and then backed up his truck and filled the pool with water. He and his wife and a buddy and his wife proceeded to jump into the pool with their beers and bathing suits and waited for the game to start. I sat there and shook my head and told the guys, 'Hey, you've got to come and see this, it's beautiful.'" But it all started at that very first Hurricanes game, the night that the RBC Center (then known as the Entertainment & Sports Arena) opened its doors. And as Paul Harvey would say, "that, my friends, is the REST of the story."